Accomodation for participants will be in hostels №1 and №3 in double and triple rooms. Shower and wash rooms are available on the floor as well as kitchen. Sport hall (where the event will take place) - 10 min by bus. The rooms are free for 5 participants of each team. 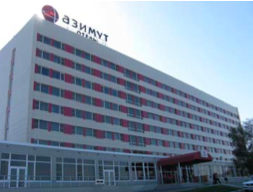 Also there is "AZIMUT Hotel Astrakhan" - with the capacity of 400 people. "AZIMUT Hotel Astrakhan" is situated in the center of the Astrakhan city at the picturesque embankment of the Volga River next to the riverside wharf. The hotel is placed near the principal traffic arteries: 15 minutes from the airport, 10 minutes by car from the railway station and 10 minutes by car from the sport hall. It is used for placing of guests and volunteers - 300 places.